Have you ever wondered what it would be like to own one of the most exclusive addresses in the world? Knightsbridge Circle, the world’s most exclusive travel and concierge club, are ready to open the door for you. 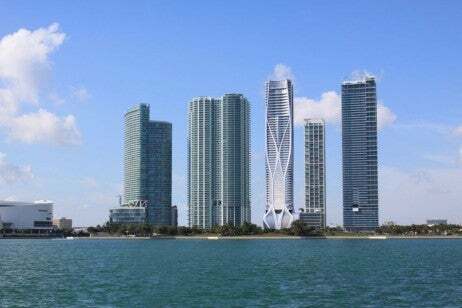 One Thousand Museum in Miami is designed by starchitect Zaha Hadid. With the sought-after address of 1000 Biscayne Boulevard, the development will be a one-of-a-kind masterpiece. One Thousand Museum is being billed as a ‘six star lifestyle’ and includes two floors of wellness and spa facilities, a sunbathing terrace overlooking the Miami skyline and a private helipad. As if that’s not enough, olfactory consultants 12.29 have created bespoke perfumes for all the interior spaces. There will be eight full-floor penthouses – each are 9,774S sq ft with a 1,304 sq ft terrace. The crème de la crème will be the Duplex Penthouse. This spectacular penthouse is 15,200 sq ft with 1,270 sq ft of terraces, including two Zaha Hadid signature spiral staircases. In addition, this individual property also features an indoor swimming pool and a private elevator to the helipad. This crown jewel penthouse (USD $45m) will be one of the most sought-after properties in the world. Enjoying the Miami sunsets are reason enough to have this one-of-a-kind property in your portfolio. One Thousand Museum will be billed in the top 10 billionaire skyscraper homes in the world along with the likes of One Hyde Park in London, Tour Odéon Monaco and 432 Park Avenue in New York. For further details please contact Knightsbridge Circle’s Manager of North America, Mr Jeff Dunham.